Horizon Blue Cross Blue Shield of New Jersey (Horizon BCBSNJ) has been recognized nationally as a top company for Latinas. 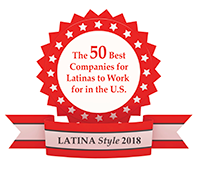 The designation was revealed today as LATINA Style Magazine released its Top 50 Best Companies and the LATINA 50 Style Report. The LATINA Style 50 Report is the most respected evaluation of corporate America’s career advancement opportunities for Latinas. A lifestyle magazine for the professional Hispanic women, LATINA Style evaluates 800 companies and recognizes those that provide the best career opportunities and work environments for Hispanic women in the United States. Among the principal areas of evaluation are: the number of Latina executives, Latina retention, mentoring programs, educational opportunities, employee benefits, job retraining, affinity groups, and Hispanic relations. Evaluations for the 2018 annual report are based on 2017 data. “As an employer with a workforce rich in diversity, we are gratified when a publication wholly focused on advocacy for Latinas distinguishes us as a best company for Hispanic women,” said Alison Banks Moore, Chief Diversity Officer for Horizon BCBSNJ. “Through our employee affinity groups, professional development activities and employment practices, Horizon is committed to maintaining a welcoming and rewarding work environment for Latinas,” she said. About Horizon Blue Cross Blue Shield of New JerseyHorizon Blue Cross Blue Shield of New Jersey, the state's oldest and largest health insurer is a tax-paying, not-for-profit health service corporation, providing a wide array of medical, dental, and prescription insurance products and services. Horizon BCBSNJ is leading the transformation of health care in New Jersey by working with doctors and hospitals to deliver innovative, patient-centered programs that reward the quality, not quantity, of care patients receive. Learn more at www.HorizonBlue.com. Horizon BCBSNJ is an independent licensee of the Blue Cross and Blue Shield Association serving more than 3.8 million members. About LATINA Style Inc.LATINA Style Inc., is the publisher of LATINA Style Magazine, a lifestyle magazine for the professional Hispanic woman. The magazine has been published for 24 years and has a national circulation of 150,000 and a readership of nearly 600,000. The company is host of the LATINA Style Business Series, the LATINA Style 50 Report, the National LATINA Symposium and the LATINA Style Hero Initiative. To learn more about LATINA Style visit www.latinastyle.com or call (214) 357-2186. Connect with LATINA Style on social media at @LATINAStyleMag on Facebook, Instagram, and Twitter.